couple of tables away, sharing a few muted laughs I struggled to hear. He, an Ethiopian refugee, was to be the subject of my final story in a journalism course. 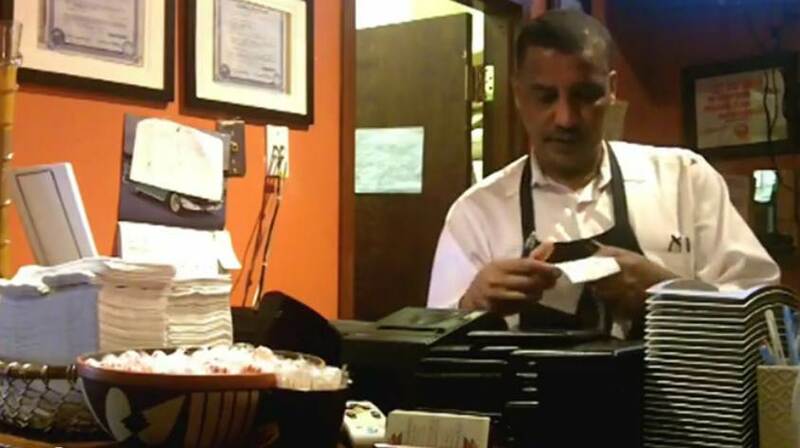 But in the Ethiopian Diamond Restaurant on Chicagoâ€™s north side where he was general manager, I was the foreign one awkwardly trying to insert myself into a new setting. Daniel Berhanu emigrated from Ethiopia in 1987 to escape a brutal civil war. He left as part of a countrywide exodus of young people, desperately avoiding being drafted by their countryâ€™s militant government. After spending a few months in a refugee camp in Sudan, Daniel secured the papers he needed to join his extended family in the United States. I expected Daniel, who was thousands of miles away from his home, immersed in a culture that was not his own, to feel hopelessly out of place. Yet Danielâ€™s unabashed confidence was present in every soft word he spoke. Far from being alone, he had become an integral part of a network of fellow immigrants. Daniel had arrived in the United States knowing no one but, through the Ethiopian Community Association and other Chicago organizations, had quickly built up a tight group of refugees. Through these people he was able to maintain a relative degree of normality as he resettled in the Edgewater neighborhood. The Ethiopian Diamond and other restaurants like it served both as revenue generators and places of solace for Ethiopians. On the other hand, I was lost. Beneath the dim lights and thick red hangings of the Ethiopian Diamond, I struggled to negotiate even the smallest task. Thick incense smoke from a table nearby made it even difficult for me to pick out an appropriate table for the interview. After seven weeks of reporting on the Edgewater community, I thought I was an authority on local businesses pertaining to immigration. But, as Daniel kindly offered me a scalding cup of tea, I realized that I was on the outside. Daniel guided me through a situation in which I was entirely unprepared. After the interview, Daniel invited me to meet some of his Ethiopian coworkers. I sat down at the circular table where the incense was burning, and listened to the men and women joke in a language I could not understand. They offered me coffee, saying that Ethiopian coffee was the best in the world. I accepted gratefully, and sipped my drink slowly as they talked. Their conversation switched to English and we began to talk about their experience in the U.S. Trading stories of schoolwork, delicious meals we had eaten, and favorite places around this city, I relaxed. One of the waiters gave me a tour of the historical paintings on the wall. Ethiopian landmarks, historical figures, and mythological scenes grew more vivid as he spoke. I left the restaurant ecstatic. I felt as though I had somehow gained a foothold into this unique community. Three nights later, I decided to take some friends to eat dinner at the Ethiopian Diamond. I advised my friends on what plates to order, which coffee suited the meal, that tea would be provided before the appetizers even came. As we waited for our server, I explained the meaning of the paintings on the walls, reciting the names the waiter had taught me. I hoped my friends would be impressed by my intimate knowledge of the restaurant and its workers. After all, I had learned so much from Daniel. Embarrassed, I flushed. My friend quickly covered for me by ordering a plate of Doro Tibs Alicha. As my friends chuckled, I realized how little I knew about Daniel, and how presumptuous it was for me to think I could be an insider in a community he had spent 20 years building. He had his network of friends, I had mine. Grateful, I turned back to the still laughing group of people.